Notes: With these socks you have to kind of trust the pattern because you don't see right away how it's going to happen, but they turned out really good. Except for the bottom of the foot. There are these "bumps" which EZ does mention in the pattern, saying they can be steam ironed away. I don't know if that's going to help me, as they're quite pronounced and I think I could have used another few decreases before ending the sock. I got a comment on the Zimmermaniacs blog from someone claiming to be Meg Swansen (if its really her I'm totally starstruck) mentioning 3 segment shaping every half inch which I think will work a bit better. You can see the bottom of foot bumps. Looking back I think some decreases before the last row would have been prudent, but when I need to re-foot these I can work on that problem, in the meantime, I'm working on another pair for myself in Elann Peruvian Highland Wool so I'll experiment with those too. The pointed heel. You can see that my fiance has very strange ankles so ignore the weirdness, but the heel is there. I also really loved the pointed heel (seen in the last photo). It looks really pretty and fits my fiance much better than the normal heels I do for him, so if I can figure out the bumpy thing on the bottom of the socks I'll be making these almost exclusively for him. I will definitely be doing ribbed socks for him exclusively from now on, as well, because it helps a lot with his high arches and big heels. 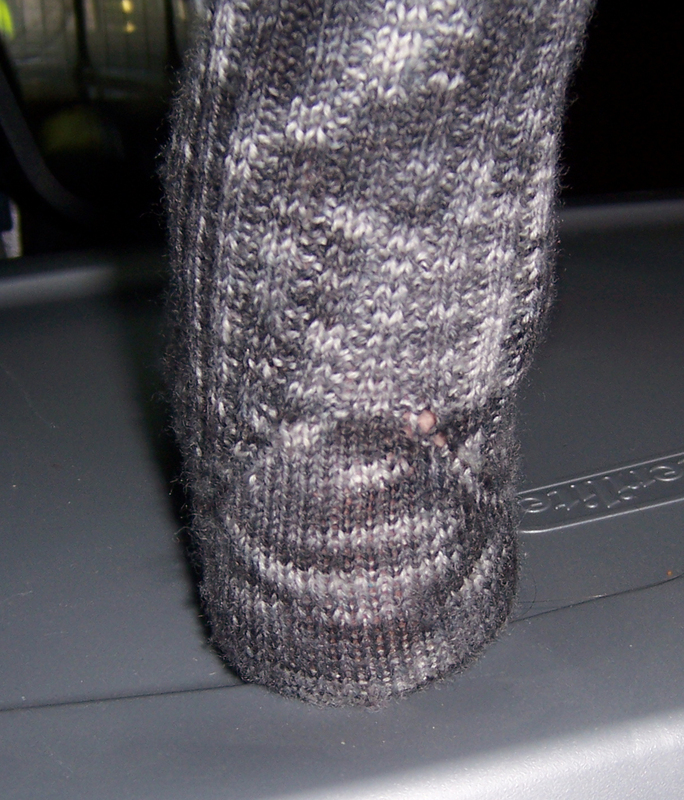 I can make the ribbing so that it's much bigger when stretched out and it'll go over his heel, but then pull in when he puts it on. I've had SOO many problems sizing his feet until I realized it was his high arches that were causing my woes. As a note- there were definitely some holes when I picked up stitches (You can see some in the heel photo) but to fix those I just went through and tightened the row- starting at the hole, you pull the leg of the stitch till it tightens up, then you go sideways, pulling leg after leg of the stitch until the 'looseness' spreads itself over several stitches. Worked really well. Also, I can tell from the writing that EZ thinks a lot of the toe she does on these socks and she's right- it looks really nice. So, I got my order from Blue Moon Fiber Arts today. I had ordered 3 skeins of yarn- 1 skein of 24 karat, 1 skein of Mustang Sally, and 1 skein of lover's leap- 2 reds because I wasn't sure which one would be best for a Gryff sock kit. Turns out Mustang Sally was, because Lover's Leap was (as I suspected but wasn't quite sure) definitely more pink than red. But it worked out- I have a skein of STR to call my own. OH, yes, all were STR Lightweight. Yum. The yarn is really lovely, and I wish I didn't have to send off the Gryffindor colored skeins. Also, for anyone who's wondering- 24 Karat and Mustang Sally are PERFECT Gryffindor colors. I'm also working on the bag (I plan to have everything sent out on MONDAY of next week I'm just waiting for a few things to come in the mail and I have mostly everything all set) and not making it in Gryffindor colors this time, but using some earthy Crystal Palace Taos instead. Good times. 1. What did Mrs. Weasley make to eat the first night that Harry arrived at Grimmauld Place? 2. When the children are de-Doxying the curtains what lunch does Mrs. Weasley say she will bring them? 3. When Hermione arranges to meet Rita Skeeter in "The Three Broomsticks", what is Luna Lovegood eating? 4. The wizard bank Gringotts is located hundreds of miles below London, deep under the Underground. Due to this, what does Hagrid say you are mostly likely to die of even if you manage to break into one of the vaults? 5. True or False: In "Sorcerer's Stone", when asked by Harry what the difference is between stalagmites and stalactites, Hagrid's answer is: "A stalactite grows down from the ceiling. A stalagmite grows up from the floor." 6. In "Prisoner of Azkaban", Harry meets Cornelius Fudge, Minister of Magic, at the Leaky Cauldron when getting off the Knight Bus. Fudge takes him inside and sits him down to have a "chat" with him about blowing up his aunt Marge. Fudge says that everything has been repaired and that the Dursleys are prepared to take him back next summer on what condition? 7. In "Prisoner of Azkaban", Harry spends time every day gazing longingly at his dream broom, the Firebolt. The first day he ever saw it, Harry overheard the owner of Quality Quidditch Supplies telling everyone that which National Quidditch team had just placed an order for seven of them? 8. Book Three: When Harry is hiding under the table in the three broomsticks what drink does Flitwick order? 9. How much do Fred and George bet on Ireland winning and Krum getting the Snitch (Ignore the 5 Galleons for the fake wand)? 10. How much does a journey on the Knight Bus (without toothbrush or chocolate) from Magnolia Crescent to London cost? You can either post the pictures on your blog or leave a link so that we may find it. In other news, I don't want to go to work tomorrow. Why is my 'weekend' always so short? le sigh. OK, before I start with the "real" updates, I just wanna say- if you haven't already, go get on the invite list for Ravelry. I've been on there for a few weeks now and it's really worth the wait, so get on the list and wait it out. Good stuff. Lessee.. I've progressed quite a bit on the Moccasin socks for Jeremy, and next time I make them I will add a few more repeats of ribbing but I think they will JUST fit. 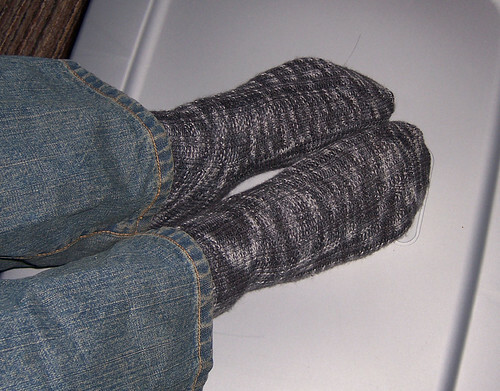 I am going to make him try them on multiple times as I knit the bottoms so that I'll be sure they fit. I got my final secret pal package last week (just a tad over deadline but my sp told me and it was just a few days so.. yeah) Thank you Miss Prism. There were a lot of British candies and some harry potter patterns (dark mark illusion scarf and weasley sweater cell cozy. And some green/black lamb's pride worsted for the scarf. I ate most of the candy, and I'm too lazy to take pics right now (God my job is exhasuting) but eventually, some day, I'll take pics of the patterns and the yarn. I ended up with the same person to spoil for the Hogwarts Sock Kit Swap 2 so I'm devising a new bag strategy for that, and the yarn has FINALLY Shipped so I should be able to get it out next Monday and beat the deadline. Whew! 1 month is not a lot of time, even though I get things done quickly! 1. "What happens if I wave my wand and nothing happens?" "Throw it away and punch him on the nose." Which two people are talking? 2. "If he raided our house he'd have to put himself under arrest." Who say this? 3. When sitting on the wall next to Professor Dumbledore at the beginning of the book, who does Professor McGonagall bet was the wizard responsible for the shooting stars seen by Muggles over Kent? 4. Known by the students as Nearly Headless Nick, what was Nick's actual name? 5. When venturing into the Dark Forest with Hagrid for their detention, who is the first centaur Harry and Hermione see? 6. We know that Parvati Patil was sorted into Gryffindor house, but what house was her twin Padma sorted into? 7. What colour do the flames turn when you use Floo powder? 8. What colour tie was Cornelius Fudge wearing when he came to take Hagrid to Azkaban? 9. After running away from the Dursley's, Harry took up a room at the Leaky Cauldron. What number room did he stay in? 10. While Ron, Hermione, and his other classmates are in Hogsmeade, Harry stops in for a chat with Professor Lupin. What did Lupin tell Harry he had just taken delivery of for their next lesson? The pictures can either be posted on your blog or you can link to them from your blog. Lessee.. I can't think of anything else right now, but I'll post more if I do. 2. Shoe size? Foot length? Foot circumference? Um.. I guess it'd be a Womens 10.5 WWW But here's the specs: 10 inches long, 11" circumference at top of toes 12.5 at top of foot, and ankle is 13inches. 3. List your three favorite sock yarns. 4. Would you like to try a new brand of sock yarn? If so, which brand? I would probably most prefer a new brand- any of the following would be MORE than awesome: STR, Chewy Spaghetti, Fleece artist (espcially the sea wool), Tofuttsies, Zen String, Scarlet Fleece. I'm open to anything pretty and good quality. Probably best to not get me any knitpicks sock yarns, though. I have pretty much every color that's there. 5. Do you prefer variegated or solid sock yarn? 6. What colors would you like to add to your sock yarn stash? Any colors. I'm especially fond of the ROYGBIV rainbow, but not especially fond of any other "rainbow" combinations, so if it claims to be rainbow but doesn't have ROYGBIV, i probably won't like it. Also not a huge fan of pastels, but pretty much anything else i'll love. 7. 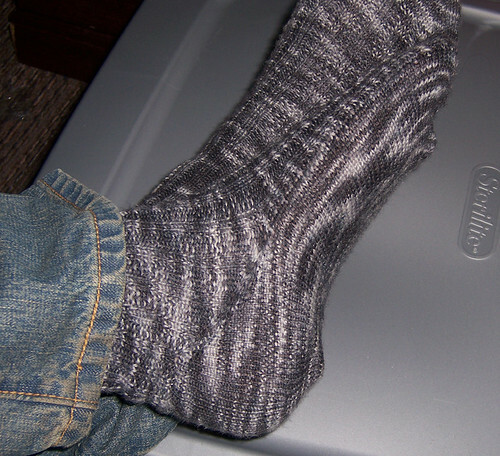 What kind of sock patterns do you gravitate toward? Lace? Ribbed? Fair Isle? 9. 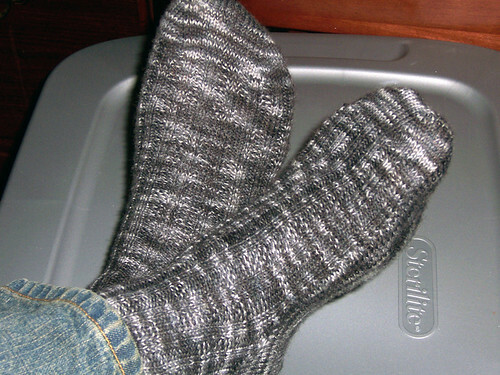 Will your socks be exposed to cigarette smoke or animals as you knit them? They only animal they will be exposed to will be ME. lol. I wash and block before sending though so none of my long falling out hairs will get in. 10. Are you willing to have an international Hogwarts Sock Pal? Sign-ups for the swap start on July 14th and it's totally going to be worth it. You should ALL sign up. Basically, what you do is knit a pair of socks for someone else, and if this is your first time participating (you should already know about the swap if it isn't) then you'll be sending along with that knitted pair of socks (In your buddy's house colors) & a set of sock needles as well as a set of stitch markers. "Second years," though (and this is my favorite part) since they already have participated in the swap and have this stuff already, get to send sock yarn and a pattern instead, because they already got the first stuff. How great is that? How many swaps even pay attention to that? Yay! EDIT to ADD: Second years also send bookmarks. Woohoo! You do have to do a little extra, and if you're planning on signing up come July 14 pay attention- 1, you have to visit the Hogwarts Name Generator (or come up with your own Hogwarts name, like I did) and get a name. Then you need to create an email address containing that name (I got a gmail one with Holly Heathertoes in it). Then you determine what house you're in (Hufflepuff here), and then you email the headmistress your necessary information. A little more work than last time but still pretty simple and totally worth it to participate in a superfun swap. I know I'm really looking forward to it.